Individuals interested in beverages with therapeutic properties may be intrigued by roasted barley tea, known in Japanese as mugicha or in Korean as boricha. 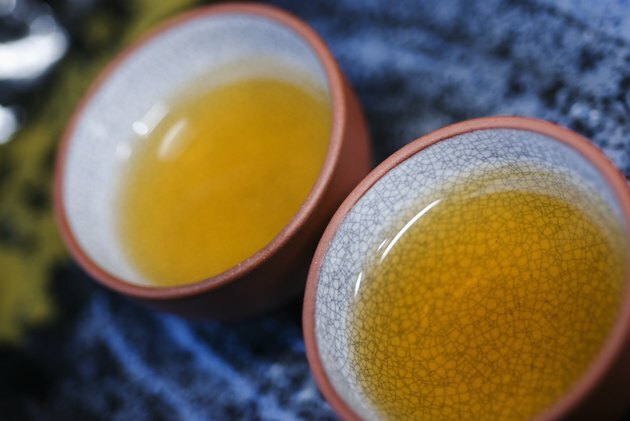 Barley tea is available in loose grains, tea bags or prepared tea drinks. It is traditionally used for detoxification, to improve digestion and for urinary tract infections, among other applications. While these uses have not been proven by scientific research, barley tea has other health-promoting properties. Roasted barley tea interferes with the absorption of oral streptococci, states the December 2006 issue of the "Journal of Agriculture and Food Chemistry." Italian researchers exposed pretreated ceramic beads mimicking tooth enamel to bacteria and the tea in various combinations, discovering that the tea inhibited bacterial colonization and adhesion. Researchers noted that one chemical known for its anti-adhesive properties was absent in barley tea which was not roasted. Barley tea has antioxidant properties, notes the December 2004 issue of "Bioscience, Biotechnology, and Biochemistry." A team of Japanese researchers from Shizuoka University analyzed the chemical components of barley tea and their effects on peroxynitrite. This unstable oxidant can lead to cell death and health complications including cardiovascular, inflammatory and neurodegenerative diseases, explains nature.com. The research team determined the presence of 10 chemicals within barley tea which were able to scavenge, or destroy, the peroxynitrite. Barley tea improves blood fluidity, according to the April 2002 issue of the "Journal of Nutritional Science and Vitaminology." High blood viscosity can lead to impaired blood circulation and related health disorders. Japanese researchers working for the Kagome Company found that the fluidity of the blood increased directly in proportion with the presence of alkylpyrazine, a substance which gives flavor to their tea.